The Dirk Diggler All-Stars were the eventual victors in the DevSummit Dodge Ball Tournament. The Sitting Ducks, shown in action, were second. 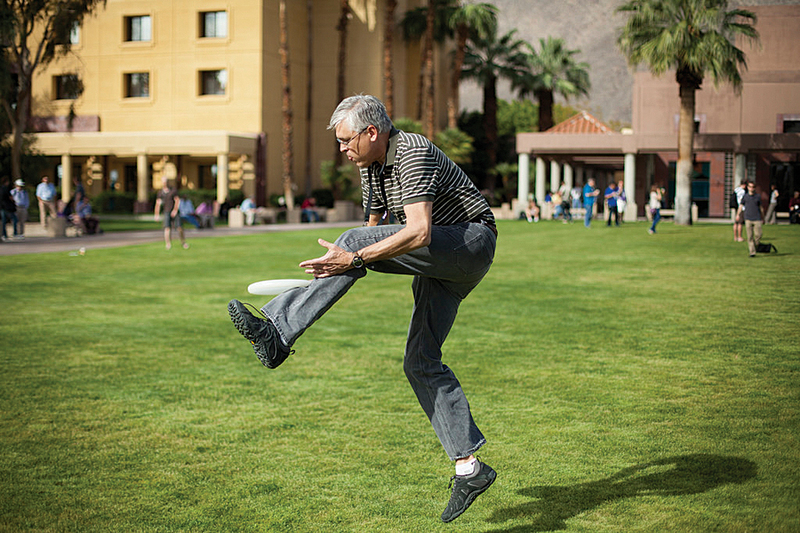 There was a lot of time for unstructured fun at DevSummit, like this pickup frisbee game. Nick Volpe (on right) and Jeremy Folds (on phone) accept the first-place award for their entry in the 100-lines-or-less-js code challenge. 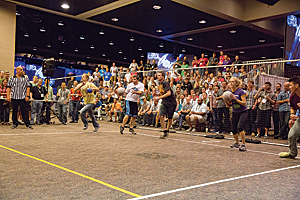 It wouldn't be the Esri International Developer Summit (DevSummit) without the DevSummit Dodge Ball Tournament. 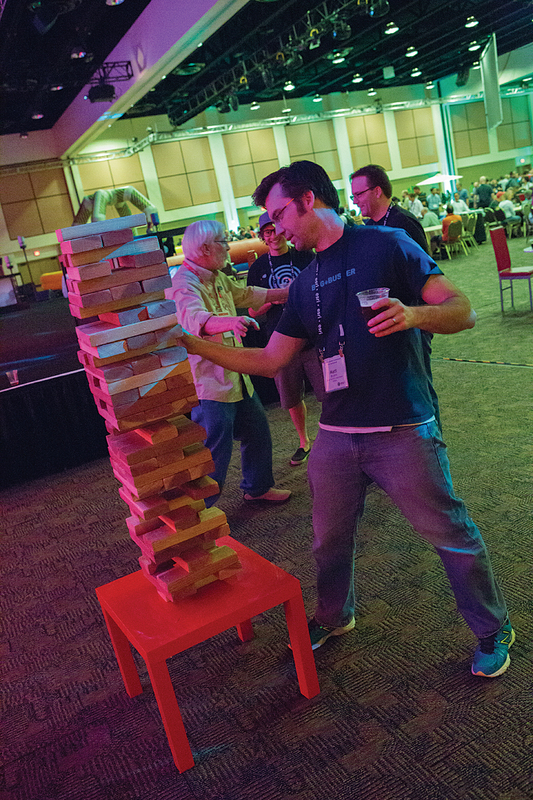 This year, 31 teams squared off on Wednesday night to compete for the top prize: free passes to the 2015 DevSummit. Bracket winners also received special T-shirts. 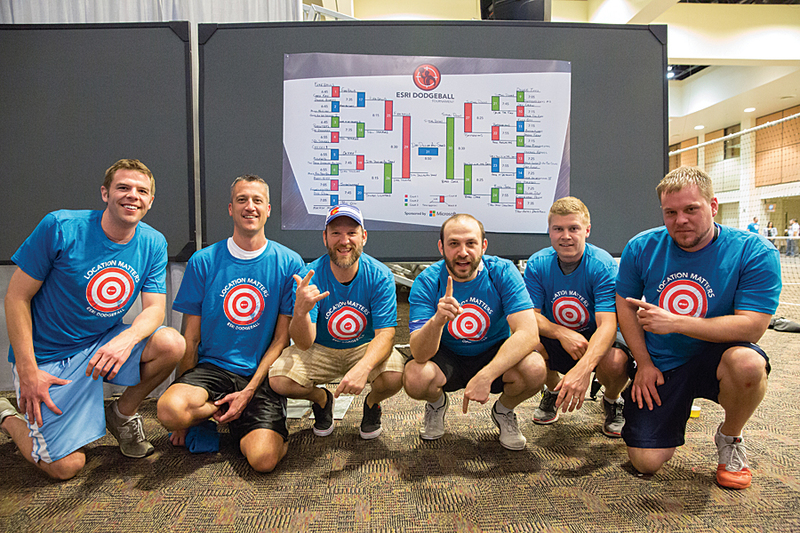 The winning team, the Dirk Diggler All-Stars, was composed of Bradley Harried, Polar Geospatial Center; Greg Schulz, Target Corporation; Jeremy Moore, Minnesota Department of Natural Resources; Matt McLees, Scott County, Minnesota; Patrick Thorsell, Scott County, Minnesota; and Joshua Pust, Target Corporation. 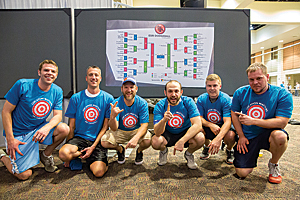 Julie Powell, Esri; Eric Ito, Esri; Russ Roberts, Esri; Mike Shaw, SpatialMax; Dave Wright, i-cubed; and Nathan Noble, Vestra Resources, filled out the roster for the second-place team, the Sitting Ducks. 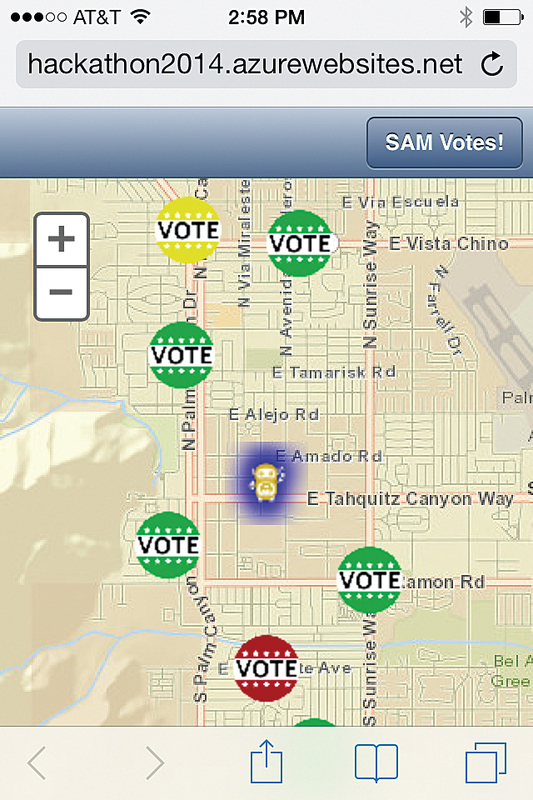 GeoHappenings, an app that provides real-time social mapping for events (like DevSummit), topped the field. 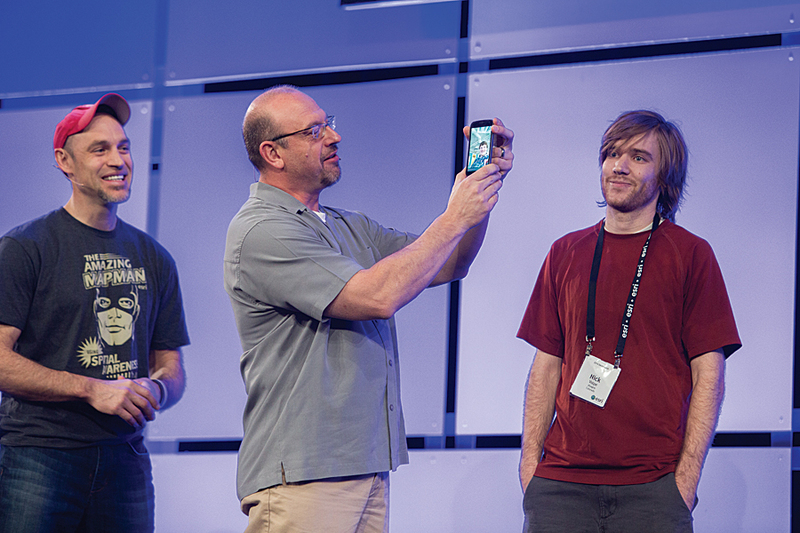 For the win, its creators, Jeremy Folds and Nick Volpe of DTSAgile in Fort Collins, Colorado, received a DevSummit 2014 pass and an ArcGIS Online subscription. Volpe accepted in person, while Folds accepted on his phone via Facetime from his office in Colorado. This was the first coding challenge the two had entered. "All in all, it was a fun app challenge, and we enjoyed competing in it," said Folds. "Watching all of the messages roll in on GeoHappenings from different parts of the globe was really awesome, and there are still a few trickling in here and there." Second place went to Billy Ashmall for the ISERV Viewer, which makes images of earth captured by the ISS SERVIR Environmental Research and Visualization System (ISERV) available to everyone. Ashmall received a DevSummit 2014 pass. Third place and a $100 Esri Press gift certificate went to Vinícius Machuca for PocketDirections, a simple ArcGIS routing app that runs on various devices. The Esri DevSummit Hackathon contestants gathered in the Renaissance Palm Springs had just one day to create community-oriented apps that integrated Esri's location-based technologies with the APIs of event partners Twilio, SendGrid, Geofeedia, and Microsoft. 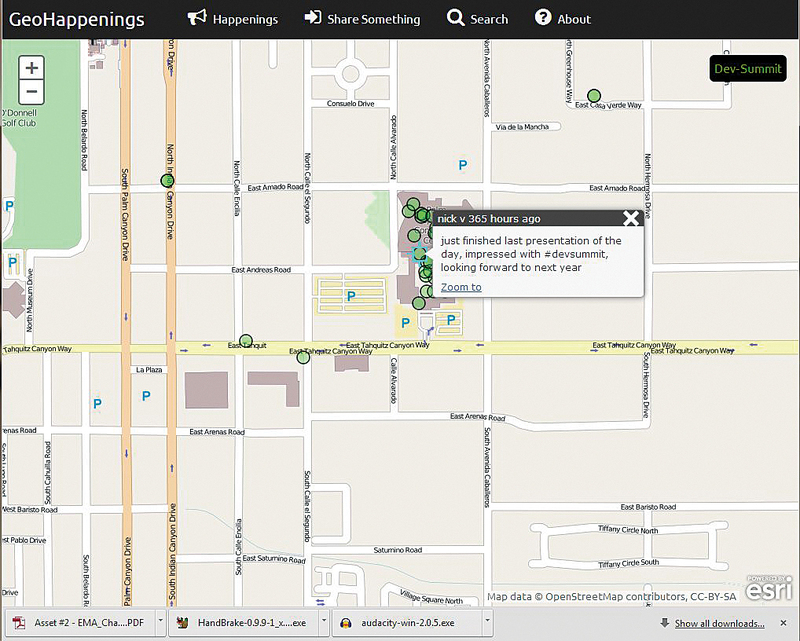 The County of Riverside, California, supplied its open data. 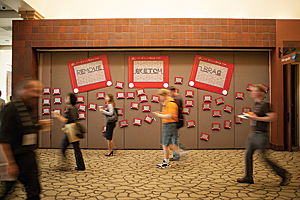 Entries were judged on innovative and creative use of technology, user experience/user interface, potential for real-world application, and completeness. The first-place team could choose Esri International DevSummit passes for 2014 or 2015 for each of its members and had three minutes to present its entry to the audience assembled for the summit keynote address. Second-place winners received AR Drones 2.0 Quadricopters, while third-place winners got radio controlled copters. Jon Nordling and Michael Humber won second place with Riverside County Community Events, an app that connects Riverside County citizens with the county's public services. 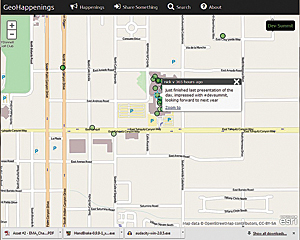 The app integrated Microsoft Enterprise SQL Server, PHP, CURL, and jQuery Mobile technologies with Riverside County data on the ArcGIS platform. In addition to Esri APIs, it used the Twilio and SendGrid APIs. The app also won Raspberry Pis provided by SendGrid. Third-place prizewinner Citizen Reporter, created by Diego Pajarito Grajales, Joshua Tanner, and Shaunak Vairagare, makes reporting incidents easy and encourages efficient decision making. 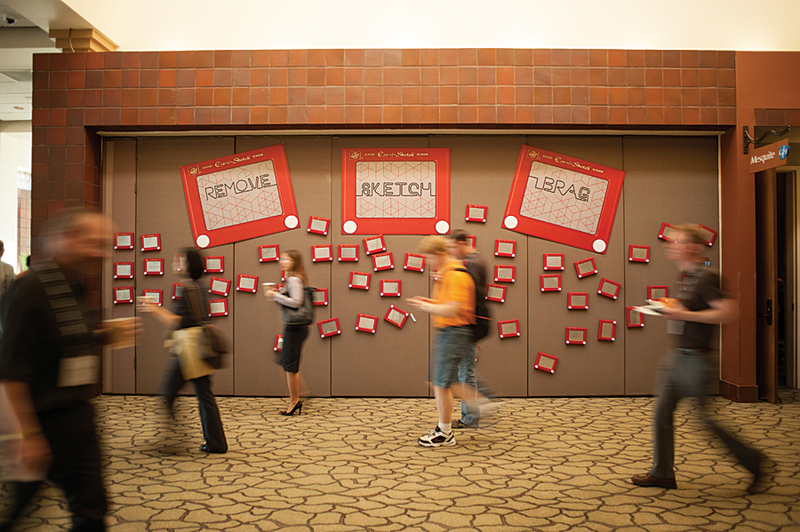 It uses crowdsourcing to prioritize events. The greater the number of reports of an incident, the higher it ranks. The world's fastest tech sessions, SpeedGeeking, covered 10 hot topics that focused on mobile but also provided quick insights into the latest in ArcGIS technology for server, big data, security, and visualization. 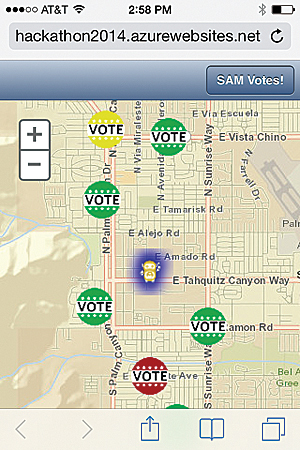 SAMVotes app won the Esri DevSummit Hackathon. The party on the last day featured a variety of games and refreshments.